Information: As an art teacher at Austin Community Academy from 1998 to 2002, Tracy Van Duinen incorporated contemporary-art practices into his classroom, helped organize an autonomous arts-based “small school” as part of school reform efforts, and led his students in the painting of many indoor murals. 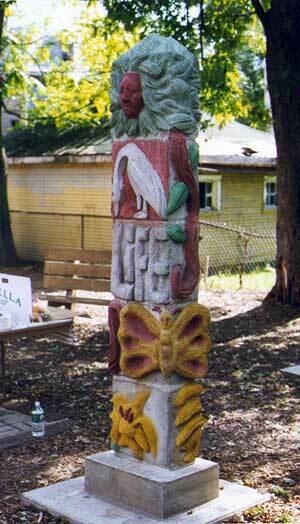 In the summer of 2001, Van Duinen fostered students’ involvement with the neighborhood at large by helping to create the Austin Community Sculpture Garden, located at the corner of Latrobe and Huron a few blocks north of the high school. The team, which included co-lead artist Carolyn Elaine and assistants Roosevelt Nunn and Catina Robinson, built three concrete relief “guardian totems” as well as a cement game table and a hopscotch pad adorned with broken tile mosaic. Longtime gardening activist Mary Peery along with her Austin Green Team transformed the vacant lot into a community greenspace three years ago—one of 18 lots the group has spruced up since the 1970s. It was Peery’s idea to enhance the space with art created by area youths and she remained an active presence and guiding inspiration throughout the program. To build their technical skills, students did low-relief papier-mâché pieces based on their drawings, and then made three maquettes in clay. John Pitman Weber served as structural consultant. The Prairie Group donated concrete for the artworks’ foundations and footings. Cement-bonded cinderblocks and fiberglass-reinforced stucco were used to build the five-foot-high totems which feature the words Nature, Family, and Peace, corresponding images, and the cast faces of Peery and student participants.